How to export to Datxplore, Mlxpore and Simulx from Monolix? 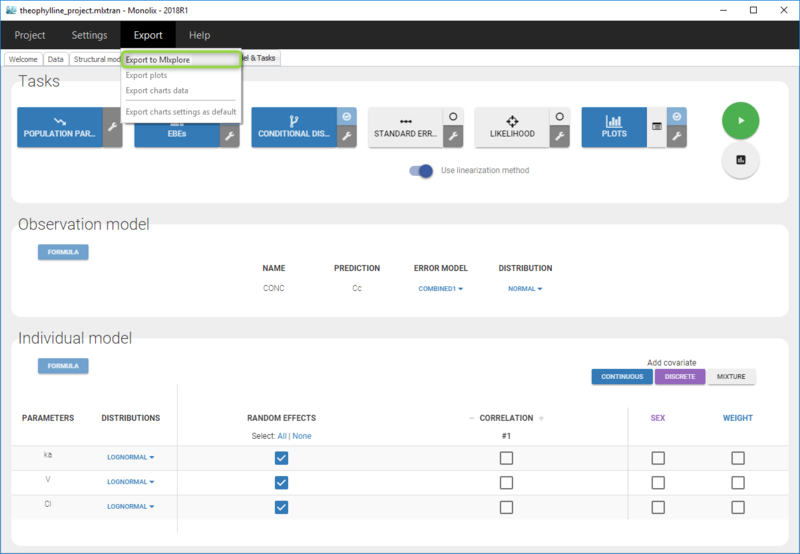 Using Monolix interface, it is possible to export your data set, your model, your project to other Lixoft software. Datxplore is a graphical and interactive software for the exploration and visualization of data. Datxplore provides various plots (box plots, histograms, survival curves…) to study the statistical properties of discrete and continuous data, and to analyze the behavior depending on covariates, individuals, etc. It is a great application to have a better look to your data set. In Monolix, you can export your data set by clicking on the “Data” frame (in green) and on the DATAVIEWER button (in blue) as on the following figure. 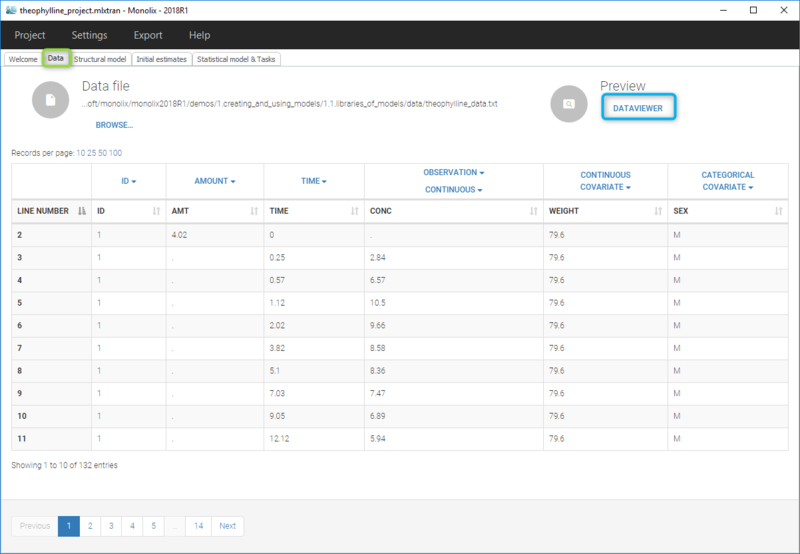 The data viewer will open and has the same functionalities as Datxplore (the data viewer is Datxplore embedded in Monolix). 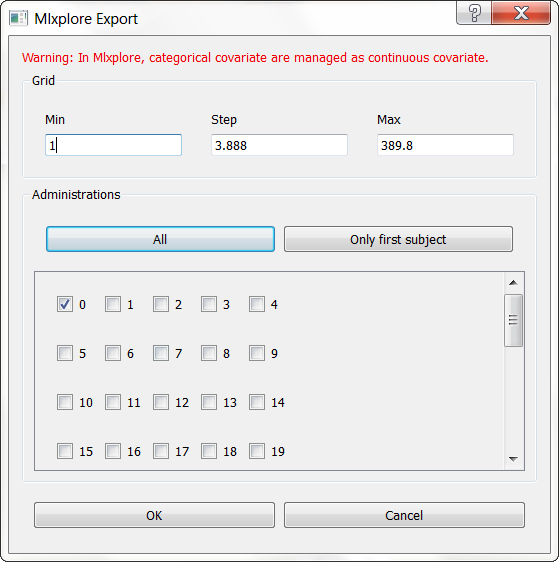 After clicking on Export/Export to Mlxplore, Mlxplore launches. Thus, you will be able to explore your model and associate it to the data set. Another important point is that Mlxplore is only managing predictions. Thus, even if a continuous error model is considered in the project, it will not be taken into account and the associated sliders have no impact on the results. This implies that the categorical covariates are not anymore considered as a category but as a continuous covariate with 0 for the reference category. The simulx function can either directly take the path to a Monolix project as input, or use a model file which can be generated from the Monolix project. This is done using the monolix2simulx function. Projects with IOV can not be exported. Projects with custom distributions for individual parameters can not be exported. Projects with bsmm function in the longitudinal model can not be exported.